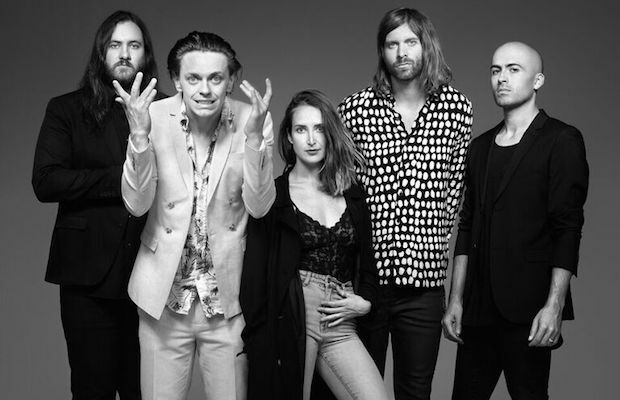 Riding high on the buzz from their fantastic 2016 sophomore effort Touch, Canada’s July Talk are fast becoming a must-know band in the alt rock world, renowned for their excellent live show and musical versatility. After a busy past year, the group are set to return to Nashville to play The High Watt on Feb. 9, a spot they last headlined in 2015, this time with locals Mona and fellow Canadians Little Junior. You can still grab tickets right here, but we’re also giving away a pair of tickets to one lucky fan! Read on for more about the lineup and enter below. Anchored by the frenetic, juxtaposed forces of vocalists Peter Dreimanis and Leah Fay, Toronto’s July Talk swiftly rose through the ranks of the alternative rock scene after forming in 2012 and self-releasing their eponymous debut LP that same year, earning immediate critical praise and radio play. Their explosive start earned the group a major label record deal as well as a Juno Award, and their ability to weave between influences of indie rock, blues, alternative, and punk has scored them spots on stage with everyone from Weezer to Against Me! to The National, Spoon, Alabama Shakes, and Tegan and Sara. Praised for their energetic, unpredictable live show, July Talk managed to further tap into their best qualities with last year’s sophomore effort Touch, and as they continue to tour relentlessly while dabbling in other projects and mediums individually, they’re fast becoming festival and radio staples, and a must-know band on the rise. Though they hail originally from Ohio and Kentucky, Mona have been a Nashville band for as long as we’ve been writing about them. Capitalizing on a huge wave of early buzz, the alt rockers released their self-titled debut in 2012 (2011 overseas), and followed it up in 2013 with Torches & Pitchforks, all the while touring the world, making festival and television appearances, and churning up positive press. Things appeared to slow down for a bit, as, in recent years, the group shuffled a couple members, but Mona made a triumphant and refocused return last year with new EP In the Middle, hitting the road with The Wombats last year before joining this run with July Talk. The band haven’t played a ton of hometown shows in recent years, so be sure to show them some love! Like July Talk, Little Junior hail from Canada, but self-described as “2 pop 4 punk, 2 punk 4 pop,” they harbor a decidedly faster, rawer, and more bombastic sound, definitely making them the most conventionally punk-leaning act on the bill. Fans of July Talk and Mona’s energetic pop accessibility will still find plenty to love though, and in the opening spot, Little Junior, friends since childhood, are primed to set to set the bar high with their energy and momentum. Winner will be announced Tuesday, Feb. 7 at 5 p.m. CDT, and will receive one pair of tickets. Good luck! Win Tix to July Talk at The High Watt! July Talk, Mona, and Little Junior will perform Thursday, Feb. 9 at The High Watt. The show is 18+, begins at 8 p.m. (doors at 7 p.m.), and tickets are available to purchase for $12-14. Reminder! Zappa Plays Zappa Rolls Through Marathon Music Works Tonight!